One of the core features of ASD is lack of social interaction. Children with ASD always find difficulty to behave appropriately in a social situation. Parents struggle to manage their children in a social scenario. This happens mainly because the children with ASD don’t know how to behave in a situation or they lack the awareness of their own action. Visual preparations are one of the best and effective methods to work with autistic children. Social stories are a type of visual preparation which mainly focused on a natural situation or skill which the child needs to learn. They are simple comic drawings which use to model a proper social scenario. It naturally teaches the child about the pragmatic rules of social interaction. 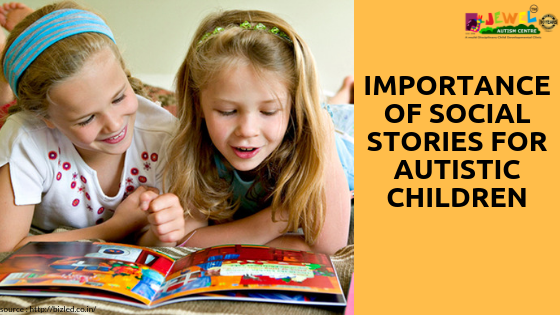 Social stories reinforce the proper behaviour of a child and correct the undesired behaviours. Social stories help them to imagine, interact, converse and play in the expected way. In order to work on this first we need to determine a topic for the social story. The topic should be related to a specific need of the child. The main character of the story should share the features of the child. Through the story child’s responses will be either reinforced or corrected. It helps them to learn how to react in a particular situation.